Torcello is an island in the northern lagoon of Venice. No other inhabited island of Venice is further away from the main island. Torcello once had almost 20,000 inhabitants, today only about 10 people live on the island. 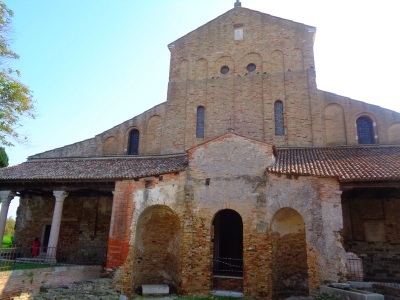 The most important sight on Torcello is the oldest church in the region. Despite its few inhabitants, the island is well connected to the public water bus network (ferries) and is visited by many tourists. The great time of Torcello was around the 10th century. At that time the island had according to different estimates 5,000 to 30,000 inhabitants. The famous church of Santa Maria Assunta is much older and was built in 639. In addition to the church, the local museum is visited by day tourists. There are several restaurants on Torcello, including the famous gourmet restaurant Osteria Al Ponte del Diavolo. Most of the sights are on the other side of Torcello Island from the ferry pier. But the distances are not very long. You walk through the island in 10 to 15 minutes. First, you walk along a canal on a footpath made of modern cobblestones. After a few minutes you pass the good and not too expensive restaurant "Trono di Attila". A few houses with beautiful gardens follow. Still along the canal, after an estimated 500 metres you reach the luxurious restaurant Osteria Al Ponte del Diavolo, a very popular excursion destination of the High Society of Venice. A little further the canal makes an arch. You cross it on a stone bridge. Now you are in the center of the today's Torcello with the objects of interest. You first see the church Chiesa di Santa Forca and only a few metres behind it the much more famous church Basiclica di Santa Maria Assunta. 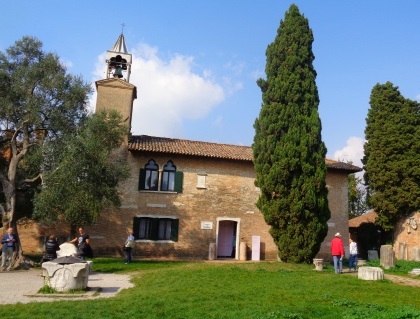 On the other side of the square is the museum Museo di Torcello. The island of Torcello can only be reached by boat, it is a real island without a bridge to other islands or to the mainland. The water buses to Torcello take about 40 minutes from Venice, the island of Burano and the island of Mazzorbo are only a few minutes away by water bus. Line 12 between Venice, the island of Murano and Torcello runs relatively frequently, in summer several times an hour at peak times. In Venice the ferries depart from the jetty "F.te Nove" (also Fondamente Nove). For many tourists who do not speak Italian, it is not easy to buy tickets for the water buses (vaporetti) in Venice. But it is also possible to buy the tickets in advance on the internet. Operating the ticket machines in Venice is complicated for many foreigners. If you find an advance booking office, there are often language problems. Moreover, the queues at the advance booking offices and vending machines are often very long. On this website you can buy the tickets (also the popular tickets for 48 hours and 72 hours). These tickets can also be used on the ferries to Torcello. In the other direction, the vaporetti of line 12 continue to the nearby island of Burano and then partly to Treporti and Punta Sabbioni on the mainland. From these two stops many tourists from Jesolo and the surrounding area come to the island of Torcello. Line 12 takes the same route back. Caution: Only about one water bus per hour goes to Treporti and Punta Sabbioni, the others end in Burano. The journey from Torcello to Punta Sabbioni takes about 35 minutes. Less important for tourists is the water bus line 9, which connects Burano and Torcello in the early morning, before the ferries of line 12 stop at the Torcello bus stop. The ferries of line 12 usually have a toilet because of the long journey time. During our journeys this WC was however several times locked. Translated, the name of the Basilica of Torcello means Church of the Assumption of Mary. The building from the 7th century (around the year 639) is the oldest building in Venice that still exists. In the 11th century the basilica of Torcello was extended and completed with a bell tower. The church looks more like a museum. Important things are signposted. Many visitors especially like the famous mosaics on the floor and on the walls. The top sight of Venice is a huge mosaic with the theme "Last Judgement" on one of the walls inside the church. Also remarkable is a mosaic depicting a Madonna with Child at the top of the dome (15th century). The Italian name of the old church is: Basilica di Santa Maria Assunta. Admission unfortunately not free: Unfortunately the church costs admission. An extra entrance fee is also charged for the ascent of the church tower (Campanile in Italian). The visit of the church costs 5 Euro, the tower of the church with a good view costs 5,50 Euro. There is a ticket for all 3 places of interest in Torcello, which cost entrance. Beside the church and the Campanile (church tower) this is the local history museum of Torcello directly opposite the basilica (see below). The tickets for all 3 attractions of the island Torcello (combi-ticket) cost 12 Euro. All Prices from beginning of year 2019. There is a reduced entrance fee for children and groups, children under 6 euros have free entrance in the church, on the Campanile and in the Museo of Torcello. In our opinion, all three sights are worth the entrance fee. 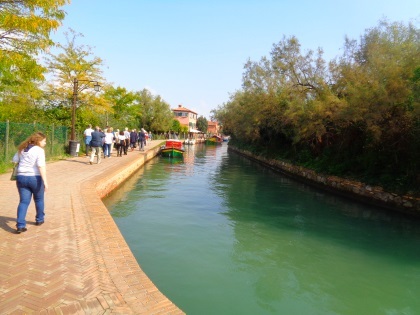 On the way from the waterbus port to the sights you will find the only ATM on Torcello. In the museum some things from the famous church are exhibited like a baptismal font. You can also admire remarkable ancient finds from the Brone and Roman periods, as well as many other exhibits from different periods on the island of Torcello. The museum costs 3 Euro entrance fee, a fair price for the small local museum. There is also a ticket together with church and ascent of the church tower (12 euros in January 2019). In total, it takes about two hours to visit the island of Torcello, as described above. You can stop at one of the restaurants or visit another nearby island, such as Burano, as part of a day trip from Venice. Most holidaymakers visit at least two islands during a day trip, some even three. For Venice, a guided boat tour to the 3 islands Murano, Burano and Torcello is almost unbelievably inexpensive. The guided trip is especially suitable for tourists who have little time and still want to see several islands. On the way in the boat one is informed about the islands and the lagoon over loudspeakers in several languages (also German). The islands are visited alone without a guide. The boat ticket is already included with the price of 20 Euro. For this price, the trip is a real bargain for the expensive Venice. The tour starts near St. Mark's Square. 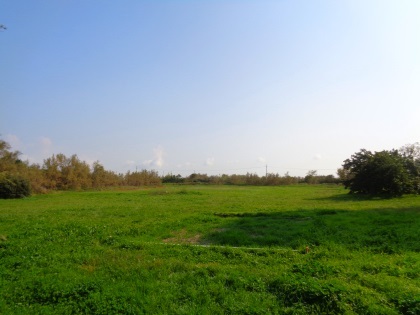 It is also worthwhile to deviate a little from the main tourist route on Torcello. Then you can see a lot of greenery on the island - meadows, gardens and trees. Popular among the many tourists is also the restaurant Ponte del Diavolo (Devil's Bridge) over a small canal on the way from the ferry to the church. The bridge is an old Venetian bridge in the old style without railings. In the past almost all bridges in Venice did not have a safety device at their side. Be careful, especially with children. Most of the about 6 to 8 restaurants on the island are on the footpath from the port of the water buses through the island Torcello to the church and the opposite museum. The menus are placed conspicuously on or next to the narrow path. The price level is a little above average for Italy, as usual in and around Venice. On the map you can see the ferry terminal and the way through the islands to the sights of Torcello.